It was almost exactly 20 years ago that my football career peaked. In the second team at a top English Premier League club, aged just 18, and part of the England Youth squad touring Brazil, they were heady days. But for most football fans, the summer of 1998 will be remembered for the exploits of my FA National School classmate Michael Owen, bursting onto the full international stage with that wonder goal against Argentina in the World Cup in France. (The next time I saw Michael, a few months later, I was on crutches with an ankle injury from which I’d never fully recover). It was a time when the football world was in a period of flux. Arsene Wenger had joined Arsenal in 1996, and it became clear later, through several autobiographies, that he inherited a squad containing alcoholics and drug addicts, yet one which could still achieve at the highest level. Manager of an obscure Japanese team but with a degree in economics, Wenger had other ideas about how athletes should develop. He started nothing less than a revolution. Wenger advocated a raft of radical approaches such as training twice a day, resting properly, no alcohol, eating healthily and taking dietary supplements. As obvious as all that sounds today, prior to his arrival, a typical day in the life of a footballer would involve two hours of training in the morning, a lunch of lasagne with garlic bread, and then off to the golf course for a full 18 holes and possibly a few pints thereafter. All of Wenger’s players soon became known for their athleticism and Arsenal’s dominance of the English game followed. His ideas spread and by the turn of the century, at Newcastle United we were also doing extra sessions and eating boiled chicken. My peers who stayed in the game have become teetotallers who experiment with pilates. Wenger’s arrival also heralded a scientific revolution in the game. According to my former teammates, by 2009, most Premier League teams were blanketing their stadia with player tracking cameras and had a least two full-time data analysts working with players and coaches. In 2012, Arsenal spent $4m on StatDNA, a Chicago-based performance analytics firm whose presentation was so impressive Wenger wanted them off the market so rivals could not work with them. Inspired by the famous Moneyball movement in baseball, the era of soccernomics had begun in earnest. Fast forward to today, and Manchester City now has at least 11 data analysts working with players and scouts. Players at this year’s World Cup will be monitored in every training session as well as during matches, with their behavior, specifically their sprint power, continually assessed for signs of fatigue. An open goal for asset managers? 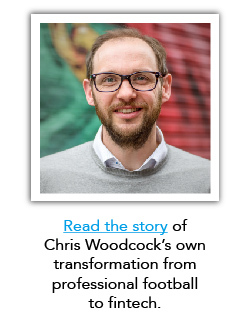 In the active fund management world, we are where football was twenty years ago: the revolution is upon us. Quantitative funds have been beating fundamental investors because they have codified their process and removed the opportunity for many of the simple mistakes humans make. The next generation of active fund managers must take a similar path in mitigating bias, and at Essentia we have shown they need not go so far to see major improvements. Data analytics can now be used to help professional investors become fitter, stronger, more disciplined and less prone to mistakes, while retaining the capacity for complex thought, inspiration and intuition. As Nate Silver demonstrated in The Signal and the Noise, modern baseball scouts now outperform pure statistical approaches, because they incorporate analytical models and their experience. It is the combination that wins. Those who are not willing to adopt these new practices are destined to see their talent buried under a heap of errors, and investors will rightly look to passive or to quant funds for more consistent performance. The upcoming World Cup, like every other before it, will be the most technical ever. Those on the pitch will be the most athletic, studious and well-prepared players to have ever played the game. From this platform, they will likely ascend to heights of skill never before seen. Despite the narrative currently ascendent in the asset management world, fund managers have it in their power to deliver the same. They can embrace both the data and the performance analytics revolution that is before them. If they treat themselves like professional athletes, and walk down the road of continuous improvement, the robots will remain on the substitutes bench.